On March 26, 2015, the U.S. Senate will vote on an amendment to repeal key U.S. anti-corruption policy. The Foreign Account Tax Compliance Act (FATCA) is an important U.S. initiative to prevent corruption, a root cause of global poverty. Call your senators TODAY and urge them to vote NO on Amendment SA 621 to the Senate budget bill. The main switchboard number is (202) 224-3121. You can also click here for a directory of Senate phone numbers. Below are some key points on FATCA and why it matters. Thank you for working alongside us to end the root causes of poverty. - FATCA helps prevent corruption. 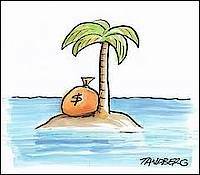 - Tax haven abuse is estimated to cost the U.S. $150 billion annually in lost tax revenue. Individual tax evasion accounts for $40 to $70 billion of that. - Repealing the law would cripple U.S. and global efforts to fight tax evasion. - FATCA has been a key component of U.S. efforts to crackdown on offshore tax haven abuse, which has yielded billions in additional tax revenues. - The U.S. should not step back from being a leader on this issue. FATCA legislation has acted as a catalyst for change and the FATCA inter-governmental agreement has served as a template for other international efforts. - Over 77,000 banks and 80 countries have signed on to FATCA.